You can request a moving house service over the phone or by completing the online form. We will need some information from you, regarding the type of property, the number of rooms, the floor it is on (if it’s a flat), etc. This will help us provide you with a free, no-obligation quote before we schedule your appointment. If you own a larger property with more than 3 bedrooms, we will organise a free preliminary viewing before giving you a precise price quotation. You can also take advantage of our video survey options to save time and proceed with the home removal process forward quicker. It is important for the professional house movers to have an available parking spot close to your property - the parking slot needs to be secured by you. If the pros need to park in a Pay & Display parking space, the cost will be added to your final price. The loading process will begin immediately, assuming that you’ve packed and labelled correctly all your belongings. The house movers will be happy to dismantle any large pieces of furniture, free of charge, and wrap them in blankets before placing them securely into the van. Note that boxes should not be heavier than 20kg. If you need assistance from packers (incl. the provision of quality boxes), just specify this during the booking process. The Fantastic pros will deliver your belongings to your new address by taking the optimal route possible. They use GPS systems to reach maximum efficiency when driving. However, we can’t be held responsible for damaged items due to incorrect packing done by you. Hence, we advise you to take advantage of our expertise and combine your home removals service with our additional packing solutions. With the packing service from Fantastic Removals, your belongings are fully insured during the transportation. Also, note that our removals firm is unable to transport your pets or any hazardous goods. We will need you or another trusted person at the delivery address to provide the removalists with proper instructions. A valid parking space near your new house is also essential. The house movers will carefully unload all the boxes and furniture and place them in the rooms they are supposed to go in. If you require help with unpacking your belongings, we can handle this, too. In addition, the skilled movers are equipped and experienced in assembling any pieces of furniture, which have been dismantled prior to loading. You can order quality moving materials and labels, benefit from our packing services and have your furniture disassembled prior to loading. We can also arrange a deep-clean for the property following the household removals process, or store your personal belongings in a storage unit. 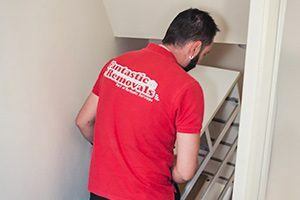 We here at Fantastic Removals are all about putting your needs and safety first. If you are looking for a prompt house moving service that is also fully insured, we got you. 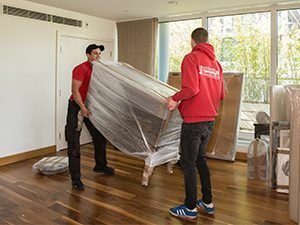 The household removals solutions we offer are fast, easy to schedule and all performed by trained and vetted professionals who have public liability insurance. One of the most important parts of a successful moving experience is transportation quality. All of the Transit and Luton vans we use for your removals services are modern, regularly inspected, and completely safe. They also come with tails lifts in order to ensure an efficient loading process. For bigger household removal jobs, we can easily arrange a convenient video survey. Simply use your smartphone or tablet. Get on a conference call with one of our representatives and walk around the property, showing them what needs to be moved. They will take note and calculate the quote for your service. When you join our Fantastic Club, you will receive an annual 10% discount on more than 25 domestic and commercial services. This, of course, includes all removals and packing services that we have on offer. You will also have access to preferential booking slots and can preserve your membership rights on the go by using our GoFantastic app. Declutter and throw away things that you can do without prior to your household removals session. This will help you to decrease the overall costs of your move and will certainly speed up the whole process of household furniture removal. You can also check out our moving checklist for more tips on how to prepare for the house move. If the house removers park far away from your home, this will certainly inflate the cost of the service, as it would take them longer to transfer your belongings into the van. Thus, do your homework in advance and organise a convenient parking space as close as possible to your house. Whether you are selling your old house or you are vacating a rented accommodation, a good and thorough clean before you hand the keys makes sense, right? Moreover, in the second scenario, your security deposit is at stake! So, take advantage of our move out cleaning service and get this worry off your shoulders! Once the house movers have placed the last piece of your load, you can get on with the unpacking. Start with the essentials first and leave less important household furniture and boxes for the following day. If you require our assistance to unpack your homeware and furniture, we'll be more than happy to help! Use stretch wrap to protect your household furniture for the move. Don't take the risk of having the movers load it in the van without any extra protection. It's your responsibility to take care of preparing your furniture prior to the moving day. This will prevent it from getting scratches and other damage. Be it cosmetics, medicine or food, you'll probably need it during the move. Don't pack essential stuff in moving boxes, use a handbag instead so you can have access to it while on the go. We highly recommend that you pack your handbag with essentials a few hours before leaving the old destination. Until then, you will still need most of its content. This is a very essential step of the moving process. If you do it correctly, it will afterwards make the process of unpacking a lot easier and faster. If you have fragile or sensitive items packed in boxes by you, leave a note so the movers are alarmed to take extra care of such moving boxes. Remove any items placed on top or inside furniture such as tables, desks or wardrobes. This will help the movers to dismantle the furniture faster, which will also result in lower duration and house removal costs. Q: Things have changed and I need to postpone my appointment. Will I be charged for this? A: No worries! Just notify us 48 hours in advance and we’ll reschedule your moving service, free of charge, for a day that suits you better. Q: I’m packing myself but what about large pieces of furniture? Can you move those? A: Absolutely. Our vans are furnished with tail lifts for safe and easy loading and unloading. If the piece of furniture is too big, we can have it dismantled. Q: Can you help with a partial house move? A: Yes. Whether you are sending your son to university in a different city or you just want to transport items such as household furniture or personal belongings to your parents, we can help. Small home moves are usually covered by our man and van solutions. Q: I need to vacate my property but there will be a few days until my new home becomes available. What do I do? A: We can help you with this as we offer convenient storage solutions. For more information, get in touch with our friendly customer care team. A: In most cases, you’ll be expected to pay upon completion of the service. Only for very large moves, we may require a deposit, payable upfront. We accept cash, card payments and bank transfer. Q: How do you calculate the price for the full house removals service? A: The moving house service is charged hourly. And different factors are taken into account, regarding our hourly rates. For instance, the type, size and floor of the house, the number of house movers needed to complete the job, the time and day, during which the service will take place, the type of vehicle that will be used, etc. are all considered when we formulate the final house move costs.